Not only is the garage door one of the first things people see when approaching your home, it is a doorway that you frequently go through on foot, in a car, with bicycles, and other random garage items. In other words, it has to look good while also being safe and functional for you and your family. So here is a quick list of tips that allow you to give your own garage door a checkup without always having to call a professional. One of the best ways to keep the garage door running safely is to just notice any changes in the sound or the speed of operation. Most problems that eventually become worthy of a repair job start off with an odd sound and can be dealt with more easily before they become an issue. And by catching signs of an issue later, you can save yourself the money of having to schedule a major repair or replacement instead of just a quick tune up or repair job. When you're looking it over, if you notice dirt in the track or any obstruction � just remove it. All kinds of dirt and garage bits can get in the track over time and prevent the rollers from moving in the track smoothly and quickly. And while you're at it, give the whole system a once over. One simple method, especially for those of us that are not naturally mechanically inclined, is to think about "reading" the system from left to right. Most of the system is easier to see with the door down, so you can start at the bottom left and go up and over and down the right side again to get most components, and then from the door to the motor to examine the actual lifting mechanisms. Proper lubrication can be the difference between an individual component lasting its full long life or becoming noisy or failing years early. Look for a quality 3 in 1 lubricant and check out this video on how to properly, easily lubricate your door. Dry San Diego environments can lead to rails without proper lubrication and marine environments can promote surface rust. One of the most important components of a garage door system is the spring. The spring's main function is to work against gravity to pull the door up. When the spring is healthy and properly tuned, it dramatically reduces the amount of force required of the motor. Another key element of the spring is that it makes it possible to get out of your garage if the power is out! Fortunately, it is easy to do this check and it doesn't need to be done frequently. Here's how: Start with your garage door in the closed position. First, locate the short red rope and handle. There is a bar that connects the top of your garage door to the opener rail in the red rope and handle is at the end of this bar away from the garage door. Notice how the rope is attached to a small lever. Pull the handle down once and note the position of the small lever before and after pulling. After the rope has been pulled down, you can grasp the bottom of your garage door and lift it up manually. The door should come up without excessive force, and should stay put when you let it go. When you are done testing these two things, carefully close the door and hold it all the way to the ground. Then, you will need to reengage the mechanism that was released by pulling the rope. To do this, stand on a small step ladder and return the small lever to its original position. This may take a jiggle to snap into place. Test that it is properly engaged by giving the door a light tug. It should not open as the mechanism is holding it closed now. If the door was easy to open and stayed open by itself than it is correctly adjusted. If not, it should be checked by a trained technician. Note: the springs contain a great deal of stored energy and can be dangerous to work on if you are not properly trained! Use these tips to keep your garage door running safely all year long and to prolong the life of all the parts that keep it moving! 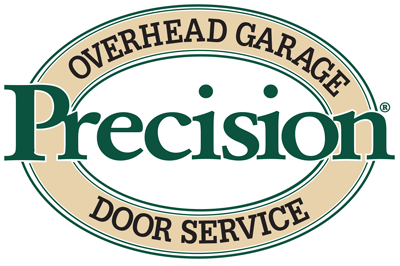 But if you need any help, don't hesitate to call a Precision Door expert technician today!